Situational awareness: Saudi Arabia's energy minister tells reporters in Moscow that it has increased crude production “significantly” to a near-record level of 10.7 million barrels a day amid intense pressure from President Trump to reduce prices, Bloomberg reports. Not long after we put yesterday's item about Shell's big new Canadian LNG project to bed, I received a Wood Mackenzie note taking stock of the action. We believe 2019 could be the busiest year of LNG [final investment decisions] ever. It seems that mega-projects are back. Their piece cites different estimates of how much global LNG demand will grow, which range from 360 million tons per annum (mtpa) to as much as 450 mtpa in 2023. (Per Shell, it was 293 mtpa last year). The endgame of the Elon Musk-SEC mess was even more dramatic than I thought. What's new: Last night, New York Times' James Stewart reported details about how the Tesla CEO and the board went from rejecting a deal Thursday to accepting a harsher settlement two days later. Why it matters: The reporting offers a window into Musk's behavior and the internal dynamics of the company. Mr. Musk had given the board little choice: In a phone call with directors before their lawyers went back to federal regulators with a final decision, Mr. Musk threatened to resign on the spot if the board insisted that he and the company enter into the settlement. Not only that, he demanded the board publicly extol his integrity. Yes, but: Musk changed his mind shortly afterwards as the company's stock dropped sharply, NYT writes. Go deeper: Axios' Dan Primack and Felix Salmon discuss the settlement on the Axios Pro Rata podcast. Speaking of Tesla, the company reported its closely watched third-quarter production and delivery numbers for all their models yesterday. The numbers are Tesla's highest ever, with over 80,000 vehicles produced and 83,500 delivered. That included delivery of 55,840 Model 3s, which they noted was twice as many as all prior quarters combined. The big picture: The data also reveal hurdles. The company built 5,300 Model 3s in the final week of the quarter, but Musk had been hoping for Model 3 production of 6,000 cars per week by late August. "Aside from production, Tesla is facing a new set of challenges associated with moving into the mainstream. While Tesla’s Fremont, Calif., factory is churning out cars, the company is struggling to put them into customers’ hands," the Wall Street Journal reports. They were 41% lower than the same period last year and down 17% since 2018 began. Yes, but: GM spokesperson Jim Cain says, "The decline is more a function of us diverting production to Canada and South Korea, coupled with low stocks in the U.S."
Mazda: CNET reports that Mazda is poised to enter the EV space. "The automaker said ... that it believes that five percent of all its car sales will be made up of battery-electric models by 2030," CNET writes. The future: The Associated Press reports from the Paris auto show that new European Union emissions standards are expected to bolster EV sales on the continent. "The new rules could increase sales of electrics in Europe from a minuscule 0.6 percent of the 14.5-million vehicle annual market to the high single digits over the next five or six years. From about 10 available models there would be several dozen to choose from," AP reports. States: Thor Trucks' Dakota Semler writes for Axios, exploring how states are using money from the settlement over VW's diesel emissions scandal for EV charging and other initiatives. Exxon: Reuters broke the news yesterday that ExxonMobil may sell "many" of its Gulf of Mexico oil production assets as the company focuses on other regions. "Irving, Texas-based Exxon is focusing on promising acreage in offshore areas such as Guyana and Brazil and onshore in the Permian basin of Texas," they report. BP: The company said Wednesday that it has a new technology development and deployment agreement with Norwegian oil company Aker BP. "Through their planned strategic alliance, BP and Aker BP intend to explore potential venture capital investments targeting technology and innovation improvements, including developments in digital twins, advanced seismic techniques and processing, and subsea and robot technology," they said in a statement. BP has a 30% stake in the Norwegian firm. Policy: This S&P Global Platts item shows why Energy Secretary Rick Perry's recent comments downplaying the idea of releasing oil from the Strategic Petroleum Reserve should be taken with a grain of salt. "[A]nalysts said Perry’s comments may ultimately mean little and an SPR release, potentially later this month, was still a real possibility," they report. Petrochem: Bloomberg reports that Saudi International Petrochemical (Sipchem) signed a $2.2 billion merger agreement with Sahara Petrochemical. "A merger would increase the scale and resilience of the petrochemical sector in Saudi Arabia and internationally, according to the statements. It will also provide cost synergies, improve access to feedstock and capital markets," per Bloomberg. Renewables, part 1: The Columbia Energy Exchange has a wide-ranging chat with Adnan Amin, the director general of the International Renewable Energy Agency. One noteworthy moment is when Amin says that leaders of some petro-states, when speaking privately, signal that the global transition away from oil could occur faster than they publicly acknowledge. "You know, one of the interesting things that I found over the last couple of years in particular is that there is a growing realization among countries that are major oil economies that this change is coming," he said. He says the "public discussion" is about an elongated, multi-decade horizon. "This is a common position that’s taken because anything else would immediately affect the markets. But there is a private realization that this is happening." Renewables, part 2: Exchanges at Goldman Sachs looks at the state of European renewable power markets. “Quickly, the economics of renewables are taking over, and they are becoming as important as policy, and we think in the future they are becoming more important,” says Goldman Sachs Research’s Alberto Gandolfi. Batteries: Greentech Media's The Interchange explores how and when batteries will eventually begin to widen electric flight beyond drones to human travel. Expect a progression over years and decades. Think air taxi commutes and trips to the airport, then eventually short flights from one smaller regional airport to another, while longer-haul travels are even further off. Fun listen: I'm just going to tuck this in here. The new episode of The Rewatchables, one the Ringer Podcast Network shows, is a fun and informative chat about the movie "Dazed and Confused" on its 25th anniversary. Haven't seen it? It would be a lot cooler if you did. That's a bit of energy humor about a very serious topic. 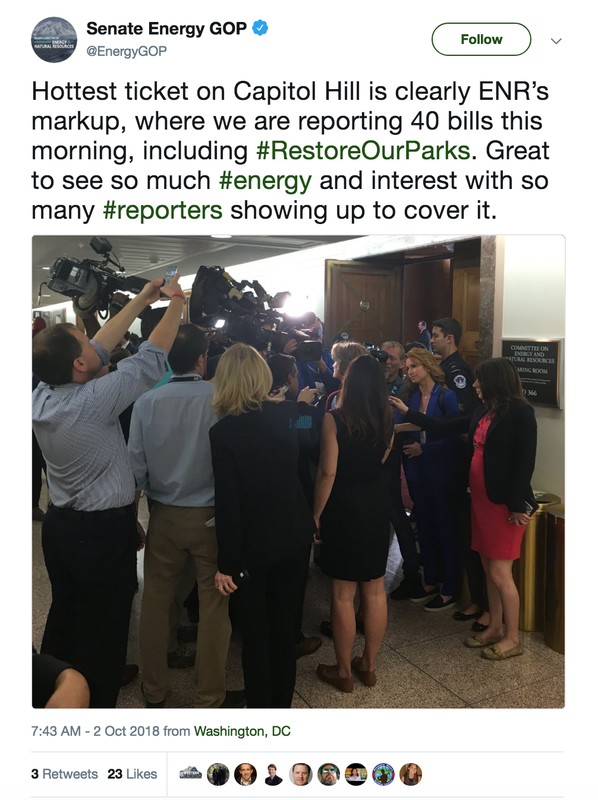 The tweet above is from the GOP staff on the Senate Energy and Natural Resources Committee wryly joking about the crowd of reporters who used yesterday's markup to stake out Alaska Sen. Lisa Murkowski. Of note: The chairwoman of the energy panel is also a swing vote on the Brett Kavanaugh SCOTUS nomination.